Sunday was our first day of truly being able to sleep in since we’ve arrived. Nothing was on the schedule until mass at noon at Parroquia Madre de los Apóstoles. I still have a hard time following Spanish mass for obvious reasons, but I’m much better at following Spanish during mass than I am in normal conversation since I know what is being said in English. Hurray for a universal church that worships Christ with the same mass all over the world! 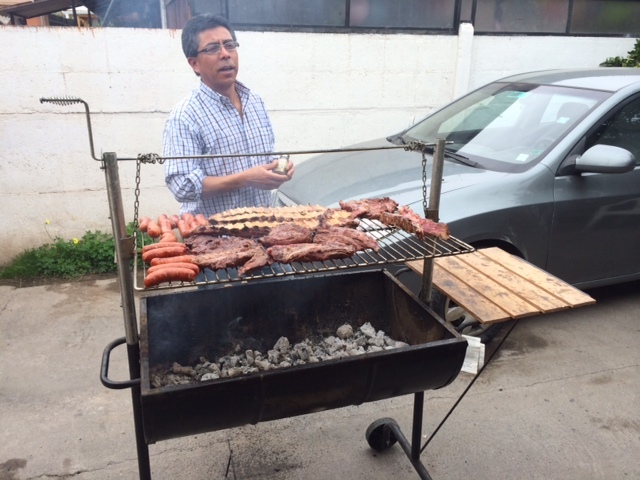 Marco’s dad the grill master. After mass my host family invited the Sodalits and Halee’s host family over for a barbeque at their home. I haven’t eaten so much food in one sitting in months! We had chorizo, pollo, churrasco, and… whatever you call ribs in Spanish. And that’s just the carne. We also had plenty of ensalada, papas, arroz, y vino. You can tell that by this point either my Spanish is improving a lot, or I worked really hard to remember the names of foods back in high school Spanish class. After witnessing how much I loved Chilean wine and the other mixed drinks that they served (one was a sort of mango juice, and the other basically tasted like a white russian), I think my host family may suspect that I’m an alcoholic. 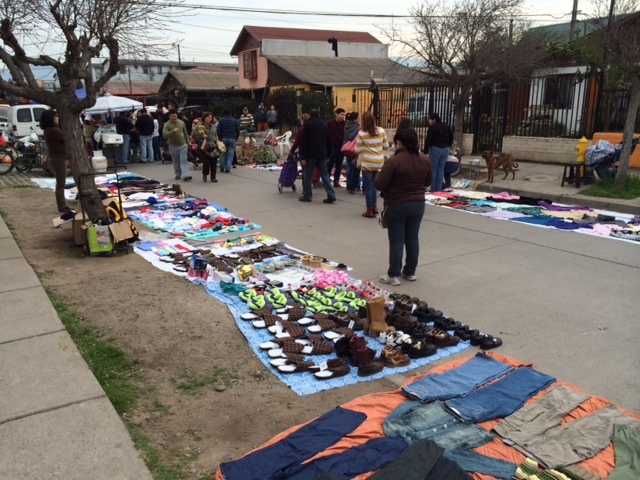 Vendors show off their goods at the fair outside the parish in Maipu. In the evening we took a trip to the other parish that the Sodalitium runs in Chile, located in Cordillera, one of the wealthiest districts of Santiago. Driving from Maipu to Cordillera felt like going between two different worlds. The first felt a few steps up from the poorer sections of Lima, while driving through the streets of Cordillera seemed just like I had ventured to one of the wealthiest parts of Austin (Westlake), Dallas (Highland Park), or Denver (Cherry Creek). It wasn’t just that I was in two different cities. It was as though I was in two totally different countries. Sunday gave me even more insights into the type of polarization that exists between the wealthy and the poor in Santiago. And it was encouraging to see that the Sodalitium is working in both Cordillera and Maipu to bridge those divides and serve both those who are suffering most, as well as those who are in the positions to bring about the greatest change in the country. It’s clear that Christ didn’t come to save just the rich or just the poor, but all of us. 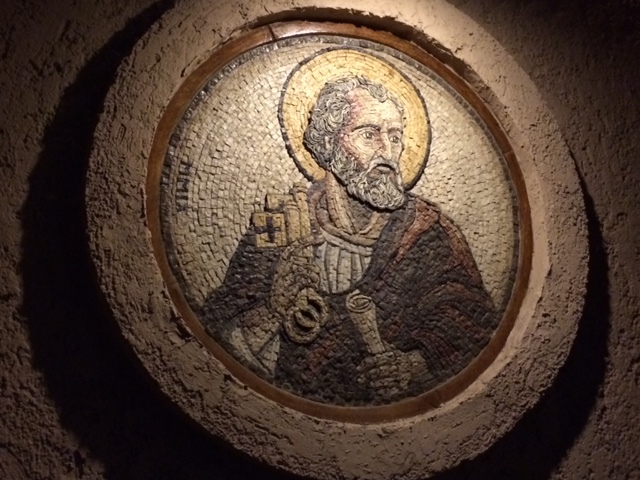 Mural of St. Peter outside the parish in Cordillera. 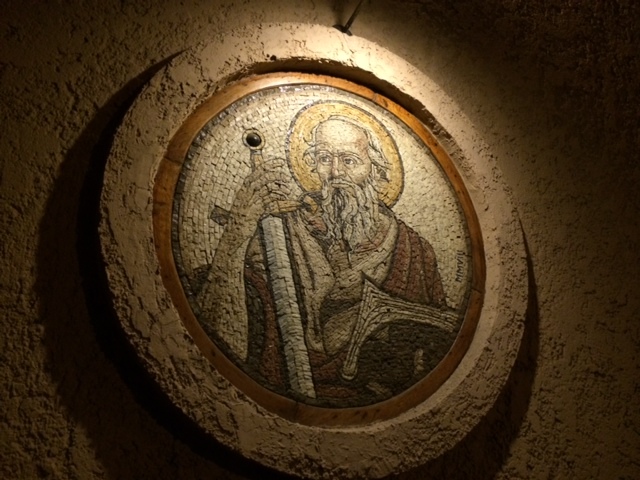 We returned to a more typical schedule on Monday with an hour of prayer in the morning which included a hard-hitting meditation written by St. Alberto Hurtado, whose tomb we had visited a few days earlier. After morning prayer we resumed our ministry to the elderly in Maipu by visiting 4 more homes. The men and women we saw were suffering from a lot of the same problems that we had seen before. They had all lost many of the relatives who were closest to them. In some cases, children of theirs who had been caring for them left without notice. They talked to us about their own children and grandchildren, many of whom were experiencing broken marriages and serious illnesses. One woman talked extensively about St. John Paul II’s trip to Chile in 1987 and how it changed her life and the country. I’ve decided to call her modest home the “JPII House” of Chile because it had no fewer than 10 pictures of the late Pope. She was so glad that we visited her that she insisted on giving us one of her pictures of JPII to take with us. The rest of the group decided that it should go with me to decorate my house in Texas. I’m already getting excited about sharing it with my housemates and adding it to our collection. The rest of the afternoon was spent reflecting on our experiences so far and discussing as a group if Christ in the City could thrive in Chile. We came to the conclusion that Chile would be a good fit for CIC’s mission, but there would be a lot of differences between the programs to account for the many cultural differences between the United States and Chile. I’m excited to see what happens during our last few days here in Santiago and if we’re able to get Christ in the City Chile off the ground in the upcoming years.